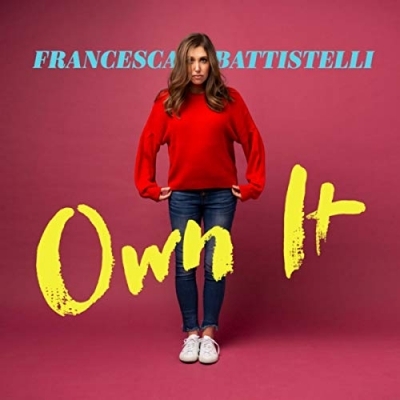 Own It, the latest release from multi-award winning Curb | Word Entertainment artist Francesca Battistelli, is available now. With critics already touting the album as "exceptional" and "engaging," Battistelli's long-awaited fourth studio album has been in the making for two and a half years. Own It is the follow-up to her GRAMMY-nominated album, If We're Honest, which features the GRAMMY-winning song, "Holy Spirit." To celebrate the album's launch, Battistelli joined her label, family and friends at a special VIP event held earlier this week in Nashville. Sharing stories about the making of the album, she also gave the attendees an early listen to a few of the new songs. A special surprise during the event was when Ryan Dokke, SVP/General Manager of Curb | Word Entertainment presented her with a Gold plaque for the RIAA certification of her top-charting single, "He Knows My Name." Francesca Battistelli, who was named Artist on the Rise from YouTube Music, co-wrote nine of the ten songs found on Own It with such songwriters as Matt Maher, Bart Millard of MercyMe, David Garcia, Mia Fieldes, Jeff Pardo, Molly Reed, Ellie Holcomb, Seth Mosley and Josh Bronleewe. The video to the album's first single, "The Breakup Song," exclusively debuted on Apple Music. Her latest music video, for the song "This Could Change Everything," just released and can be viewed above.